To activate iCloud Photo Library, you will have to set up both your iPhone and computer (Windows/Mac). 1. For iOS 11 users, tap on "Settings"> Your name and then tap on "iCloud" to get "Photos". For iOS 10 and earlier, go to "Settings">"iCloud" and tap on "Photos & Camera". 2. Turn on "iCloud Photo Library" toggle switch. 1. Download iCloud for Windows program from the website and install the software on your PC by following the step by step prompts of the wizard. 2. Run iCloud for Windows on your Windows computer and sign in with Apple ID credentials. 3. Now, find and click on "Options". 5. Open "Windows File Explorer" from your computer, and find the "iCloud Photos" folder under "Favorites". 6. Tap "Download" after selecting the desired videos. 1. Simply, navigate to "System Preferences", and then hit "iCloud". 2. Now, click on "Options" and enable "iCloud Photo Library" inside. 3. Now, open the Photos App to get hold of all the synced iCloud videos on Mac. Now whenever your iPhone and computer are connected to Wi-Fi, sync will start its magic! So, here is how to set up iCloud Photo Library to get all your iPhone videos transferred to your computer right away. Do make sure you have a stable Wi-Fi connection while you go for this option. 1. First, plug-in your iPhone to your Mac using the original USB or lightning cable. 2. The Photos App will be launched automatically after detection. If not, you have to do it manually. 3. You will see all your iPhone videos and photos on the Photos App interface now. 4. Simply choose the videos you need and hit the "Import" button on the right top corner after selection. The process is complete and your chosen videos will be available on your Mac. 1. First, connect both your iPhone X/8/7/6/6S/5/5S/SE etc and Windows 10/8/7 PC using the original USB cable. 2. To take a shortcut, enter "Windows"+"E" on your keyboard to open the "Windows File Explorer"
3. Now, tap on 'Trust this computer" on your iPhone if you see a pop-up on iPhone. 4. 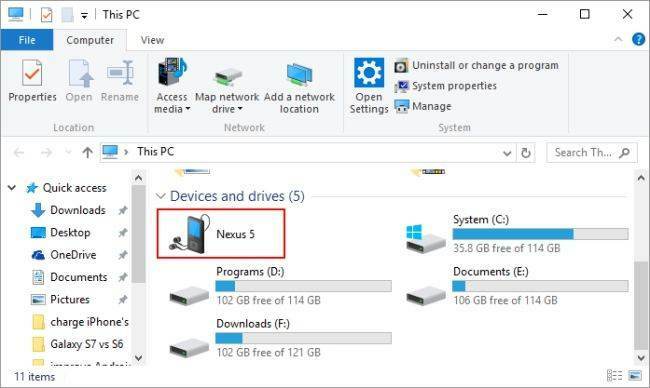 Find and click on "This PC" option inside the devices section for Windows 10/8 or click on "My Computer" for Windows 7/XP. 5. Find and double-click on "Internal Storage" folder to find the DCIM folder inside. Find and select the desired videos to manage them whenever you want to from your Windows PC. You can copy and paste them to your desired location for backup. Selective and bulk transfer videos. Transfer any kind of videos irrespective of size and genre such as from the camera roll, iMessage, WhatsApp videos, Kik etc. Backup and restore videos, speed up and clean device, fix iOS stuck, repair OS etc. 1. Download and install the Tenorshare iCareFone software on your PC. 2. Launch the program and use a USB cable to connect your iPhone to your PC right away. 3. Now, find and open "File Manager" from the interface and select the "Videos" option from the list. 4. All your videos will be listed in front of you. Preview and select the desired videos that you want to send over to your PC. 5. Tap on the "Export" button to finish. All the videos you selected will be transferred to your PC in no time now. It is as simple as that! So, in this article, we have listed 4 most effective ways on how to upload videos from iPhone to PC, for both Windows and Mac respectively. Every single one of them is tried and tested many times. And if you want to know about our unbiased verdict on which method to go for, we would recommend Tenorshare iCareFone. W use it ourselves and no other method can offer such effectiveness to transfer videos. Not to forget the range of features that easily beats the other options hands down. Go for it and try it out yourselves! If this article is helpful, don't forget to like, share and comment below! !